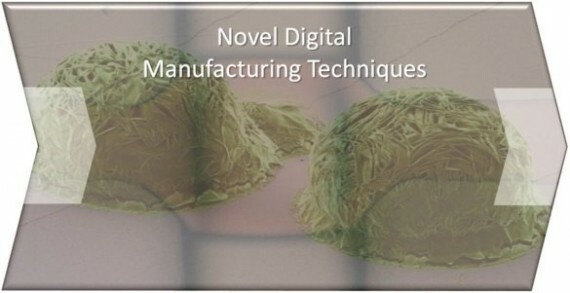 Our research focuses on using digital fabrication techniques to enable novel platform technologies that can be used in environmental sensing, biosensing, drug delivery and biomaterial design. These techniques need to be compatible with a new range of materials and must be able to integrate biological components (antibodies and proteins, for example) as well as advanced functional materials, such as nanowires, carbon nanotubes and a range of 2D materials. Driving device manufacture possibilities through dramatic decreases in achievable feature sizes. Examining formulation and deposition of nanomaterial inks to ensure their function is maintained during processing. 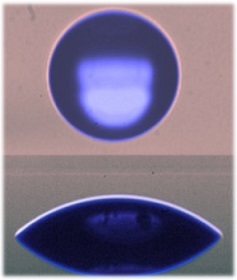 Building an understanding and control of droplet-droplet interactions and reactions at the microscale. FIAM’s Yoanna Shams is researching a hybrid technology which combines additive techniques such as advanced lithography and inkjet printing with subtractive techniques, using ultra precision lasers to remove and shape the materials. This combined approach allows us to overcome some of the challenges that inkjet techniques still face and to manufacture sensors from a wide range of advanced functional materials. The project brings together support from EPSRC, industrial partner M-Solv Ltd and the Centre for Science, Technology and Innovation Policy to put into practice our approach of ensuring laboratory research has a path to real application.